If you are one of those people that have always wanted to experience space travel, but never got the opportunity to do so, then you will definitely enjoy the Big Bang video slot. Soar to unimagined heights with Net Ent's latest project and should you happen to land the massive multipliers that go up to 32x, you will understand where the name of the game has come from. The five reel twenty-five payline slot game was launched in January 2014 and it has been an instant hit with the casino gamers. Stylish graphics and excellent sound effects create a stunning atmosphere on the reels, whilst Wild symbol and special multipliers on each winning spin make everything all the more enjoyable. Stunning celestial objects are the first thing you would expect to see should you embark on a journey through the universe and that is exactly what you get with Big Bang. Red, yellow, green, purple and blue planets occur as regular game symbols, together with playing cards Ace through Ten, which look much better than in some other games. Flaming Sun Wild completes the list of game icons. While the game is played at fixed 25 paylines, players get to select coin value from $0.01 to $0.50 as well as between 1 and 4 coins per line. Spin, max bet or autoplay start the game, and you will need at least three matching icons on an active payline starting from the leftmost reel for a payout. Flaming Sun acts as Wild, and it substitutes for all other game symbols, but unfortunately does not offer a payout on its own. The Multiplier meter doubles with each winning spin, with the multiplier at a time applied to all wins during that particular spin. The meter rises as long as winning spins keep occurring, with x1, x2, x4, x8, x16 and x32 the values displayed on the meter. Receive five winning spins of the reels and all payouts on the next spin will be multiplied by staggering 32 times. 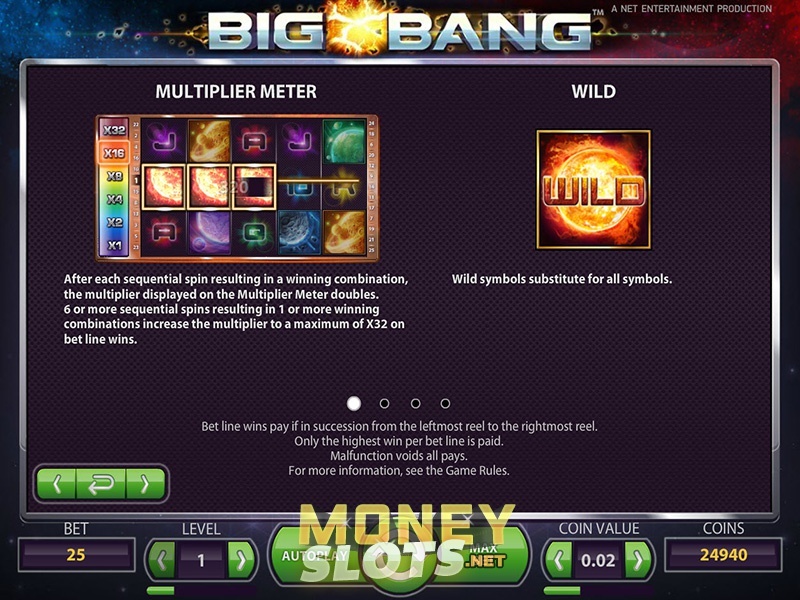 Having witnessed the huge success of the original game, Net Entertainment released Big Bang Touch in March 2014, with mobile and tablet users now able to play the exciting video slot on the move. The five reel game enables a dynamic gaming experience on the latest handheld devices, with your display set to light up each time the multiplier meter helps you to a big win or mega win.